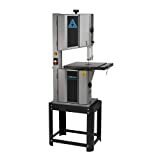 14-Inch 1HP Steel Frame Band Saw. @ speeds for added convenience, Heavy Duty Steel Frame Construction. All Ball Bearing upper and lower Guides. 2 Durable aluminum, rubber tireed, 9 spoke precision balanced wheels for superior blade tracking. Dust brush on lower wheel keeps blades clean; poly v-belt drive for smooth operation. Over sized table 15 3/4-Inch by 18 7/8-Inch precision ground cast iron; 4-Inch intregral dust port. Takes a standard 93 1/2-Inch blade.